Someone went up to a madman who was weeping in the bitterest possible way. He said: "Why do you cry?" The madman answered: "I am crying to attract the pity of His heart." The other told him: "Your words are nonsense, for He has no physical heart." The madman answered: "It is you who are wrong, for He is the owner of all the hearts which exist. Through the heart you can make your connection with God." The excerpt translated below is from the beginning of a Sufi work on the stations of the heart. In the original Arabic manuscript the work is attributed to al-Hakim al-Tirmidhi, a ninth century Sufi mystic and author. Some scholars, however, have questioned this attribution. Although the identity of its author may not be certain, the work is nevertheless of considerable interest because of its precise and detailed description of the heart and the elements which compose it. 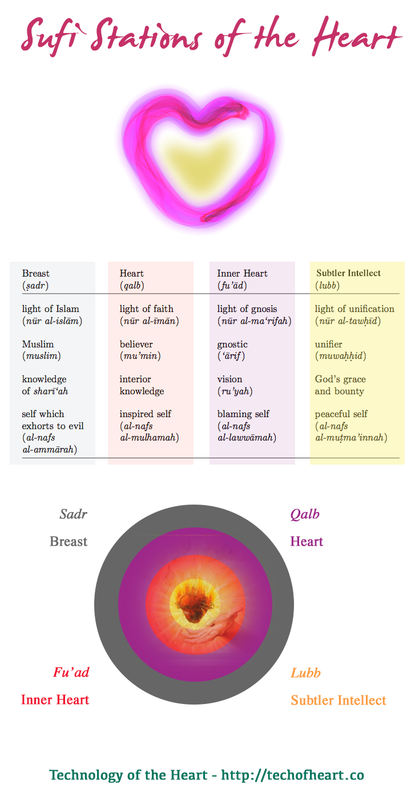 These elements, or stations in the terminology of the author, are the breast (sadr), the heart proper (qalb), the inner heart (fu’ad) and the subtle or higher intellect (lubb). They are arranged in concentric spheres, the breast being the outermost sphere followed on the inside by the heart, the inner heart and the higher intellect. Within the subtle or higher intellect are yet other stations which, however, are too subtle to be described in words. Each of these stations of the heart has its own characteristics and functions. Thus the breast (sadr) is the abode or seat of the light of Islam (nu ̄r al-Isl ̄am). It is also the repository for that kind of knowledge (‘ilm) required for the practice of Islam, such as knowledge of the Qur’ ̄an, the Prophetic traditions and the religious law (shar ̄ı‘ah). The heart proper (qalb), which is within the breast, is the abode of the light of faith (nu ̄r al-im ̄an). Faith is the acceptance by the heart of the truth of God’s revelation. The heart is also the repository of what the author calls valuable or useful knowledge (al-‘ilm al- n ̄afi‘). This is an interior knowledge of reality (al-haqiqah) that can only be granted to one by God. It cannot be learned from books or from a teacher as can the type of knowledge associated with the breast. The inner heart (fu’ ̄ad) is the abode of the light of gnosis (nu ̄r al-ma‘rifah). It is associated with the vision (ru’yah) of reality. Whereas the heart has mere knowledge of reality, the inner heart actually sees reality. The intellect (lubb), the innermost sphere of the heart, is the abode of the light of unification (nu ̄r al-tawh ̄ıd). It is the basis of the three outer spheres and is the recipient of God’s grace and bounty. Each of these four stations of the heart is associated with one of the four spiritual stages of the Sufi path. Thus the breast and the light of Islam within it correspond to the first stage, that of the Muslim. The heart proper and light of faith correspond to the believer (mu’min), the inner heart and the light of gnosis to the gnostic (‘ ̄arif ), and the higher intellect and light of unification to the highest stage, that of the unifier (muwahhid). The self (nafs), on the other hand, is not a part of the heart but a separate entity in the stomach. It is like a hot smoke and is the source of evil desires and passions. When these passions are not kept in check through spiritual disciplines, they escape from the self and enter into the breast filling it with smoke. The light of faith in the heart is obscured by this smoke and can no longer illuminate the breast. The breast, in turn, being deprived of this illumination, is no longer able to perform its proper functions and becomes subject to the authority of the self. The self, however, is powerless to affect the heart, and the light of faith within it remains firm and constant even when obscured by the dark passions which have entered into the breast. Through discipline (riy ̄ad. ah), however, the self may be brought under control and made to pass through four stages corresponding to the four stages of the spiritual development of the Sufi. Thus the self which exhorts to evil (al-nafs al-amm ̄arah bi-al-su ̄’) is the yet undisciplined self and is related to the stage of the Muslim. The inspired self (al-nafs al- mulhamah) is somewhat less evil and corresponds to the stage of the believer (mu’min). The blaming self (al-nafs al-laww ̄amah) is the self of the gnostic (‘ ̄arif ), and the peaceful self (al-nafs al-mutma’innah) is that of the unifier (muwahhid). Know, may God increase your understanding in religion, that the word “heart” (qalb) is a comprehensive word and necessarily includes [in its meaning] all the interior stations (maq ̄am ̄at al-b ̄atin), for in the interior [of man] there are places that are outside the heart and others that are within it. 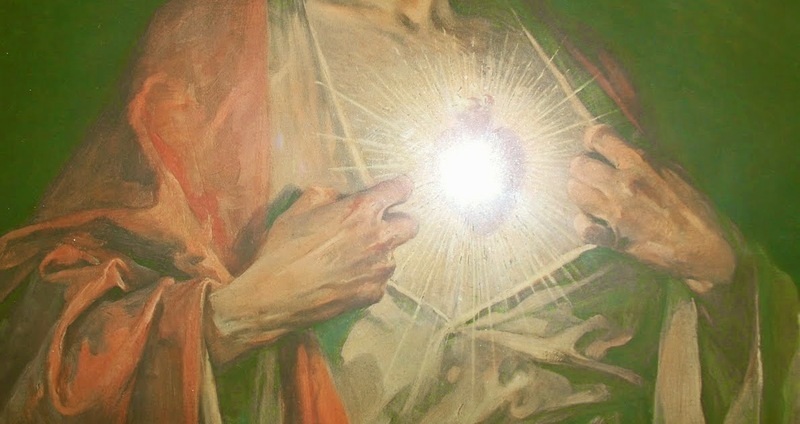 The word “heart” is similar to the word “eye” (‘ayn), since “eye” includes [in its meaning] that which lies between the two eyelashes, such as the white and black [parts] of the eye, the pupil, and the light (nu ̄r) within the pupil. Each of these parts has a separate nature (hukm) and a meaning (ma‘n ̄a) different from that of the others. Nevertheless, some of them assist some of the others, and the benefits of some are connected with some of the others. Moreover, each one on the outside is the basis of that which follows it on the inside. Thus the subsistence of the light [of the pupil] depends on the subsistence of the other [parts of the eye]. Similarly the word “homestead” (d ̄ar) is a comprehensive word for what is contained within its walls, such as the gate, the corridor, the courtyard in the midst of its buildings, as well as what is within these buildings such as the closet and storeroom. Every place and position in it has its own nature different from that of its neighbor. Likewise, the word “sanctuary” (haram) is a word which includes the sanctuary sur-rounding Mecca, as well as the city, the mosque, and the Ka‘bah (al-bayt al-‘at ̄ıq); and in each of these places there are stations (man ̄asik) [of the pilgrimage] different from those in the others. Again, the word “lamp” (qind ̄ıl) is a word which includes the lamp-glass [and the other parts of the lamp]. In the lamp the position of the water is different from that of the wick, and the position of the wick is different from that of the water, since the position of the wick is within the position of the water. Moreover, it is the wick which contains the light, and in the position of the wick there is oil, which has no water in it. Thus the soundness of the lamp depends on the soundness of all of these things, and if one of them is missing, the others become unsound. Similarly the word “almond” (lawz) is a word which includes the outer shell, which is above the hard shell, and this second shell itself, which is like bone, as well as the nut or kernel (lubb) within this shell, and the oil which is within the kernel. Thus, as a science is more elevated, its position in the heart is more secret, more special, more guarded, more concealed, and more veiled. Nevertheless, among the common people, mention of the word “heart” takes the place of the mention of all of its other stations (maq ̄am ̄at). The breast, within the heart, is that station (maq ̄am) of the heart that is analogous to the white of the eye in the eye, to the courtyard in the homestead, to [the sanctuary] that surrounds Mecca, to the position of the water in the lamp, and to the upper shell of the almond out of which the almond itself emerges if it dries on the tree. The breast is the place of entry for evil whispering (wasw ̄as) and afflictions, just as the white of the eye is subject to the affliction of pustules, inflammation of the vein, and all the other illnesses of ophthalmia. In like manner, firewood and refuse are put in the courtyard of the homestead, and all sorts of strangers enter it from time to time. Likewise predatory animals and beasts enter into the open space of the sanctuary (haram), and moths and other [insects] fall into the water of the lamp, for although there is oil above the water, the lowest position [in the lamp] is that of the water. Similarly insects, gnats, and flies crawl into the outer covering of the almond if it splits open until even small vermin enter into it. That which enters into the breast is seldom felt at the time. The breast is the place of entry of rancor (ghill), passions (shahaw ̄at), desires and wants. At times the breast contracts and at other times it expands. It is also the place in which the self which exhorts to evil (al-nafs al-amm ̄arah bi- al-su ̄’) exerts its authority, for the self has an entry into the breast where it takes charge of things, becomes proud and manifests power on its own. The breast is also the seat of the light of Islam (nu ̄r al-isl ̄am), as well as the place for the retention of knowledge that is heard (al-‘ilm al-masmu ̄‘) and must be learned, such as the legal prescriptions (ahk ̄am) and [Prophetic] traditions (akhb ̄ar) and all that which can be expressed with the tongue, for the first cause of attaining to it is study and listening [to a teacher]. The breast (sadr) was so named because it is the first part (sadr) of the heart and its first station (maq ̄am), just as the sadr of the day is its beginning, or as the courtyard of the homestead is the first place in it. From it emerge tempting desires (was ̄awis al-h.aw ̄a’ij), and distracting thoughts (fikar al-ashgh ̄al) emerge from it into the heart also if they become established over a long period. The heart proper (qalb) is the second station (maq ̄am). It is within the breast (sadr) and is like the black of the eye within the eye, whereas the breast is like the white. The heart is also like the city of Mecca inside the sanctuary (haram) [which surrounds it], like the place of the wick in the lamp, or the house within the homestead, or the almond inside the outer covering. The heart is the abode of the light of faith (nu ̄r al- ̄ım ̄an) and the lights of submissiveness (khushu ̄‘), piety (taqw ̄a), love (mah.abbah), contentment (rid. ̄a), certainty (yaq ̄ın), fear (khawf), hope (raj ̄a’), patience (sabr), and satisfaction (qan ̄a‘ah). It is the abode of the principles of knowledge (usu ̄l al-‘ilm), for it is like a spring of water, and the breast is like its pool, and just as the water flows out of the spring into the pool, so also knowledge (‘ilm) emerges from the heart into the breast. Knowledge, however, also enters the breast through [the sense of] hearing. From the heart arise certainty (yaq ̄ın), knowledge (‘ilm), and intention (n ̄ıyah), which then enter into the breast, for the heart is the root and the breast is the branch. And the branch becomes firm only through the root. The Messenger of God said: “Deeds are only according to intentions,” and explained that the value of a deed performed by the self increases according to the intention of the heart. Thus a good deed is compounded in value commensurate with the intention. Action pertains to the self; and the authority of the self extends only as far as the breast (sadr) in accord with the intention of the heart and its authority. The heart, however, owing to God’s mercy, is not in the hand of the self, for the heart is the king and the self is [his] kingdom. The Messenger of God said: “The hand is a wing [of an army], the two feet are a postal service, the two eyes are welfare, the two ears are repression, the liver is mercy, the spleen is humor, the two kidneys are cunning and the lung is latitude. Thus if the king is virtuous, his troops are also virtuous, and if the king is corrupt, so also are his troops corrupt.” The Messenger of God thus explained that the heart is a king, and that the breast is to the heart as the field is to the horseman. He also pointed out that the soundness of the organs [of the body] depends on the soundness of the heart and that their corruption results from the corruption of the heart. The heart is like a wick, and the soundness of the wick [depends on] its light, which, in the case of the heart, is the light of piety and certainty, for if the heart lacked this light it would be as a lamp the light of whose wick has gone out. No act which originates in the self, without [the participation] of the heart, is taken into account in the judgment of the Hereafter (hukm al- ̄akhirah), nor is the doer of such act taken to task should it be an act of disobedience, or rewarded should it be an act of obedience. God said: But He will take you to task for that which your hearts have garnered. The likeness of the inner heart (fu’ ̄ad), which is the third station within the heart, is as the likeness of the pupil in the black part of the eye, of the Sacred Mosque (al-masjid al-har ̄am) in Mecca, of the closet or storeroom in the house, of the wick in its position in the middle of the lamp, and of the kernel within the almond. This inner heart is the seat of gnosis (ma‘rifah), passing thoughts (khaw ̄atir), and vision (ru’yah). Whenever a man profits, his inner heart (fu’ ̄ad) profits first, then his heart (qalb). The inner heart is in the middle of the heart proper, which, in turn, is in the middle of the breast (sadr), just as the pearl is within the oyster shell. The subtler intellect (lubb), which is within the inner heart (fu’ ̄ad), is analogous to the light of seeing in the eye, to the light of the lamp in the light’s wick, and to the fat hidden within the kernel of the almond. 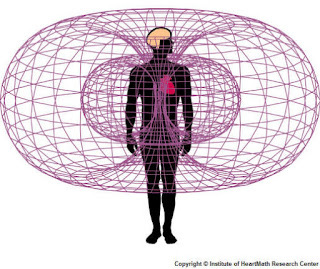 Each one of these outer entities is a shield and covering for that which follows it on the inside. Each is similar to the others, for they are similar forms working together and close in meaning one to the other, in agreement rather than in conflict; for they are the lights of religion (anw ̄ar al-d ̄ın), and religion is one, even though the ranks (mar ̄atib) of its people are different and varied. The intellect (lubb) is the seat of the light of unification (nu ̄r al-tawh ̄ıd) as well as the light of uniqueness (nu ̄r al-tafr ̄ıd), and this is the most perfect light and the greatest power. Beyond this there are other subtle stations (maq ̄am ̄at la.t ̄ıfah), noble places, and elegant subtleties. The root of them all, however, is the light of unification (nu ̄r al-tawh ̄ıd), for unification is a mystery (sirr) and gnosis is a bounty (birr). Faith ( ̄ım ̄an) is the preservation of the mystery and the vision of the bounty. Islam is thanksgiving for the bounty and surrendering the heart to the mystery, for unification is a mystery [to which] God guides and directs His servant, for he could not comprehend it with his reason (‘aql) were it not for God’s support and guidance of him. Gnosis (ma‘rifah) is a bounty which God gives to His servant when He opens for him the door of blessings ( ̄al ̄a’) and favor (na‘m ̄a), beginning without the servant’s being worthy of that and then granting him guidance (hud ̄a) until he believes that this is all from God, granted to him as a grace (minnah) and a favor (ni‘mah) from Him Whom he is unable to thank except by means of His assistance. And this, again, is yet another favor to him from God. Thus he beholds the bounty (birr) of God and guards His mystery (sirr), for He is the bestower of success. The servant does not comprehend the modality of His lordship (rubu ̄b ̄ıyah). However, he knows that He is one and avoids making Him similar to anything else, or denying His attribute, or attributing to Him a modality, or making Him unjust. This, then, is faith, which beholds God’s bounty and guards His mystery. Islam, however, is the employment of the self in devotion to God through obedience to Him together with thanksgiving and uprightness and the surrender (tasl ̄ım) of lordship (rubu ̄b ̄ıyah) to Him. It is turning away from the comprehension of the mystery, turning toward servanthood (‘ubu ̄d ̄ıyah) and persevering in that which brings one closer to Him. This is because Islam is practised only through the self, and the self is blind to the perception of the truth (haqq) and the vision (mush ̄ahadah) of it. Moreover, the self is not obligated to perceive realities (haq ̄a’iq). Do you not observe that the servant of God was commanded to have faith in the heart but was not obligated to comprehend what he believes in with respect to modality (kayf ̄ıyah) His duty is only to follow and to flee from innovation (ibtid ̄a‘). Surrender (tasl ̄ım) alone is sufficient for the self. The ineffable stations (al-maq ̄am ̄at al-masku ̄t ‘anh ̄a), which lie beyond those stations of which [we] have mentioned some, are perceived only by the servant of God who has succeeded, with God’s help, in understanding those stations [which we have] described with these well-known analogies, for God helps His servant and assists him in understanding them. These stations, which are beyond those already mentioned, are like the increased purity of water should it remain [for a period] in jars. By such analogies is the way of the ineffable mystery comprehended. Source: The Stations of the Heart. An extract from the translation of Bayān al-Farq bayn al-Ṣadr wa-al-Qalb wa-al-Fu'ād wa-al-Lubb, a Sufi work attributed to al-Ḥakīm al-Tirmidhī. In PDF format. The full translation was published in Three Early Sufi Texts by Nicholas Heer and Kenneth Honerkamp, Louisville: Fons Vitae, 2003. A digital copy, in PDF format, of my 1958 edition of the Arabic text of Bayān al-Farq (بيان الفرق بين الصدر والقلب والفؤاد واللب) can be downloaded here. The 2009 Arabic edition of Yusuf Walid Mar`i can be downloaded from The Royal Islamic Strategic Studies Centre in Amman, Jordan. The Stations of the Heart is attributed to al-Hakim al-Tirmidhi, a ninth century Sufi mystic and author. It has a precise and detailed description of the heart and the elements which compose it.